If you haven’t already heard, Loveland Ski Area is replacing Lift 1 with a high-speed detachable quad from Leitner-Poma this summer. The old lift has been removed and we are currently digging holes for the new towers. There is still a lot of work left to do, so stay tuned to Facebook, Twitter and Instagram for updates. It will be ready to go on Opening Day of the 2018/19 season! What should we call this new lift? We have a few ideas, but would love to hear from some loyal Lovelanders! 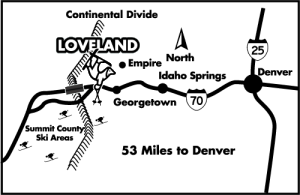 If you have an idea for Loveland’s first high-speed lift, please fill out the form below with your suggestion and contact information. If we use your name, we will offer your choice of a season pass for the 2018/19 season or your very own chair from the old Lift 1. Submit your idea today! If multiple people submit the name that we choose, the first person to submit their idea through our website will receive the prize. Participants may submit multiple entries. The deadline for submissions is July 16, 2018.